Nothing completes a wardrobe like personalization. With embroidery and monograms all the rage in fashion, now you can add it to your accessories as well. Gavere Leather is an industry leader in embossed leather and personalized pieces. Our collection of leather name bracelets can add an extra touch of unique style to any outfit. From large bracelets to more fashionable styles, you can shop whatever fits your look. Add Conchos or icons for additional personalization. When you’re shopping for that friend who has everything, personalized leather bracelets are the perfect selection! Buy for a friend getting married or commemorate a special anniversary with embossed leather. 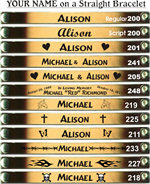 With all names burned in by a laser, you’ll get to decide the right style for whomever you’re shopping for. If you’re having a baby or know someone who is, leather name bracelets are great for announcing a birth or for a cute push present! The lightweight leather isn’t bulky or hard to wear and is designed to get better with age! Personalized Leather Bracelets and Religious Verse Leather Bracelets are all top grain lightweight leather. Each style comes in multiple sizes to fit most wrists. Woven bracelets are 1/2" wide. Straight bracelets are 5/8" wide. Many designs to choose from. Name is burned in by a laser.